Well, I was all set to write up a review of our new inflatable kayak, based on our experience in the Florida Keys. 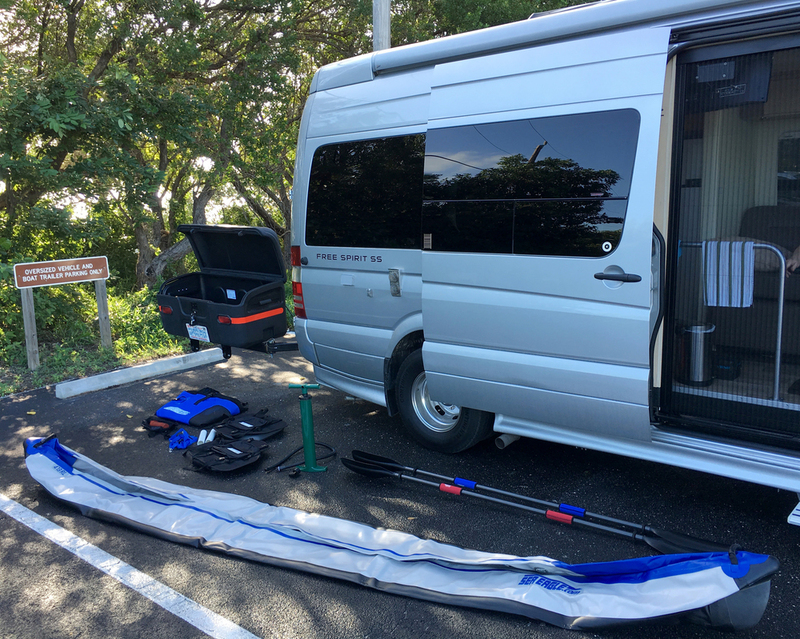 In my last blog post, I described the unique high-pressure technology behind the Sea Eagle RazorLite 473rl tandem kayak, though that discussion was focused more on the logistics of transporting a tandem kayak with our motorhome. So I will just add a little specific information based on traveling this week with the RazorLite tandem kayak, which was used three times: in the Lower Keys at Bahia Honda State Park, where we were paddling in 20-25-mph winds; in the Middle Keys at Long Key State Park, a more sheltered excursion through lake/lagoon/bay waters; and in the Upper Keys from our campsite at Point of View Key Largo RV Resort (now closed), paddling in 15-mph winds to Pelican Key in Sunset Cove. Each time, we had no trouble quickly inflating and assembling the kayak, and at 10 psi, the walls and floor do become quite rigid! We both appreciated the lighter weight of the boat (compared to our hard-shelled tandem kayak) as we carried it to the launch points. The seats are comfortable, at least for two-hour trips, and we used YakGrips to cushion our grip on the paddle shafts. Our steering skills and cruising speed steadily improved as we became more familiar with the boat; however, good tracking definitely depends on installing the removable skeg, as I found out the hard way in Key Largo. Overall, we felt that the maneuverability, stability, and tracking of this inflatable kayak were very close to our experience with a hard-shelled tandem kayak. Being able to transport a boat gave us a different range of activities compared with our last trip to the Keys, though I did miss being able to bike the Overseas Heritage Trail. Next time, the kayak vs. bicycle decision may be the hardest part about packing. All the components, before kayak inflation. Everything fits easily into the StowAway cargo box, except for the paddles, which we stashed in the shower stall while driving.